If one of your annual post Labour Day rituals is to pull the boat and put it away for the winter, you’re missing out on a spectacular fall boating season. While swimming and watersports may lose their lustre as the water temperature cools, taking in the Fall colours of the shoreline from the water is nothing short of breathtaking. Pristine anchorages, normally clogged during July and August with hundreds of boats, now offer quiet solitude. And, for anglers, the action is hot with fish actively feeding ahead of the long winter freeze-over. The benefits of fall boating necessitate extra attention and an ability to be self-sufficient because there are fewer boaters in the immediate vicinity should you require assistance. Consider these precautions to maximize your safety and enjoyment as you stretch your boating season. Before heading out, be sure to check the weather forecast. The mixing of warm and cold air can quickly spawn high winds and waves making it treacherous for small boats. Fog, too, is an issue at this time of year making visibility difficult. Should you find yourself in a fog bank, be sure to proceed slowly and sound your horn at regular intervals to alert other boaters of your presence. Well into October, daytime temperatures can occasionally be balmy but resist the urge to bring your shorts and T-shirt back out of the closet. Dressing for the water temperature will help slow the onset of hypothermia should the unexpected happen and you find yourself in the water. Accidental cold water immersion can be shocking, but don’t panic. It may take a minute or so to get your breathing under control after the initial shock but you will have at least 10-15 minutes, even in very cold water, to affect self-rescue before you will start to lose muscle control in your arms and leg. This is where an approved lifejacket, either inflatable or inherently buoyant, is an essential part of your wardrobe to keep you afloat. Be sure to leave a float plan with a responsible person on shore who will know what to do if you’re overdue. A marine radio or cell phone will allow you to call for assistance should the need arise. Having a few tools and spare parts aboard will also allow you to fix minor problems that might otherwise cause you to be stranded out on the water. Ensure that your boat and engine are in good shape and mechanically sound. Ethanol-based fuel can allow water contamination in the tank. Use a fuel additive to prevent water in the fuel line from freezing that could cause your engine to chug to a halt. If using portable fuel tanks, it’s a good idea to have a spare on board as a reserve. As you head out, be wary of reduced water levels that can result after a long, hot and dry summer season. Some of your favourite shallow water fishing holes may be inaccessible at this time of year. Also, while underway, keep a sharp lookout for debris and chunks of ice that could penetrate your boat’s hull at speed. Don’t be afraid to indulge in the splendour and peaceful solitude that Fall boating has to offer. Just keep in mind these few tips and prepare to build memories that will last till Spring thaw. 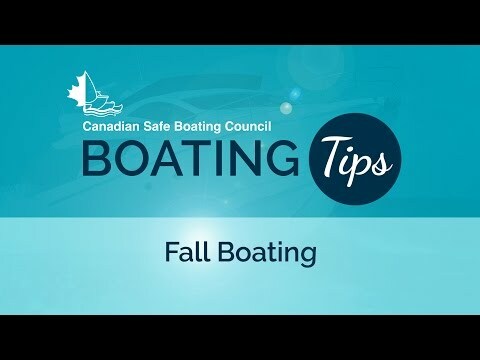 For more tips on boating safely both early and late in the season, visit CSBC’s SmartBoater.ca.